Xiahe was the first real small town we visited in China – even the kids commented on the lack of people. Maybe it was the small population, maybe it was the cold or maybe it was the general goodwill created by the Labrang Monastery, but we also had more interactions with local people in Xiahe than anywhere else in China so far. 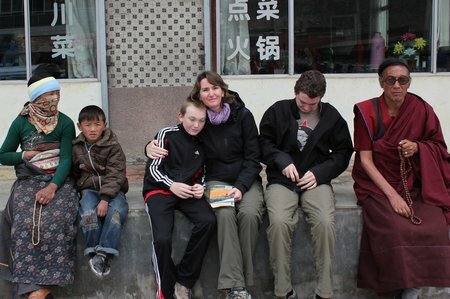 I’d put Xiahe on our itinerary as a short-cut: I didn’t want to deal with the hassle and expense of getting to Lhasa but, I still wanted our boys to get a sense of the diversity of people and cultures in China and it felt wrong to leave out Tibet. 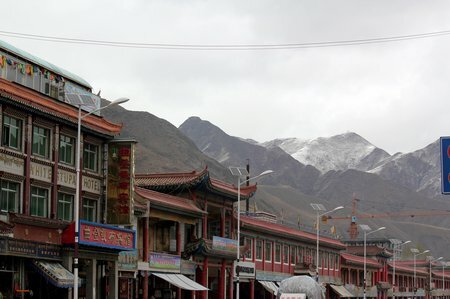 I’d read that Xiahe is known as “Little Lhasa” and is an authentic Tibetan town at the southern end of the Hexi Corridor – the traditional route from Tibet into mainland China. It didn’t disappoint. Xiahe was bitingly cold. The wind coming off the high grasslands wrapped a freezing breath around every bit of exposed flesh. The babies on the street had cheeks red raw from the wind. Copying the local women, I took to wearing a scarf wrapped many times around my neck but without their wool Tibetan-style coats, long to the feet with double-long arms, I was still cold which led all of us to stare open-mouthed at the many monks walking around in simple robes. Not satisfied that this was because of inner peace and warmth Murph went and looked up the “monk dress code” rules. Apparently monks can wear extra layers (including shoes and socks) outside the monastery, but once on the holy grounds, they must only wear their monk-ly robes. You heard it here first. The monastery itself is a sprawling complex of many temples, halls of learning and living spaces. That last was another point of fascination for us: Labrang is so well-subscribed with novices and monks that there’s a building spree in monkly abodes going on around the monastery and (if our sources are correct) price inflation for said houses. Who would have thought it? 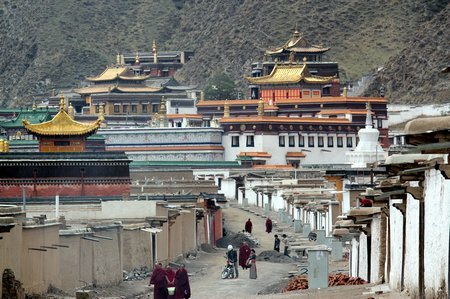 A housing boom at a Tibetan monastery?